A scientist on Twitter lamented the other day that she had her A0 grant triaged. As an expert in triaged and unfunded grants who eventually overcame to get funded R01s, here’s some unauthorized, off-the-cuff advice. What happened to this scientist’s grant that caused it to be triaged? Of course I don’t know for sure, but I’m willing to bet one reviewer read the grant carefully and saw strengths as well as weaknesses, but the other reviewer was dismissive with a cursory read. The problem is, without uniform enthusiasm, triage happens. Due to flat/declining funding over the past dozen years, competition is more intense today than ever before and study sections are encouraged to triage grants mercilessly. I may seem vague, but that’s intentional. With a triaged grant, the problem is not likely to be with the details of the methodology but rather with the overall excitement for the proposal. When she wrote the grant she probably thought very carefully about the experimental design and feasibility of experiments. What was missing was zazz. That’s right. The missing ingredient was essentially jazz hands. I’ve had discussions about whether a triaged grant can be salvaged for resubmission. While there’s always stories of grants going from triage to funded, this is the exception. Experienced hands put a triaged grant on the shelf for year, and try something completely different. Preliminary data, may be recycled, but a new approach, a new set of Aims are needed. This is debatable of course but what’s not debatable is that there was a serious enthusiasm gap and the grant needs to be rethought. My tweep commented that “I really liked this grant!” Let me be provocative and say that this was part of the problem. If you “like” your grant, who is going to love it? you don’t need to like your grant, you should be psychotically passionate about it. You should have scary eyes for your aims, and bring unreasonable amounts of firepower to bear. I like to watch the lobby scene of the Matrix to get the idea. In The Matrix analogy, the experimental tools of your experimental design are the guns. Note how Neo and Trinity treat their weapons, dropping them when they are spent and moving on without hesitation. Do Neo and Trinity “like” their guns? Tools are used simply to achieve the goal. Another problem with a scientist “liking” her grant is that it sets her up for feeling discouraged by its rejection. Nut up. This is business. Don’t get discouraged, get angry. Take a couple of personal days for reflection, but then pick yourself up, dust yourself off and get back into the fray. Keep writing. Change of gears. The PubScience in me wants to say, “Hey, young ‘uns, let’s cut the B.S., you’re listening to advice from old man telling you how to act like him. 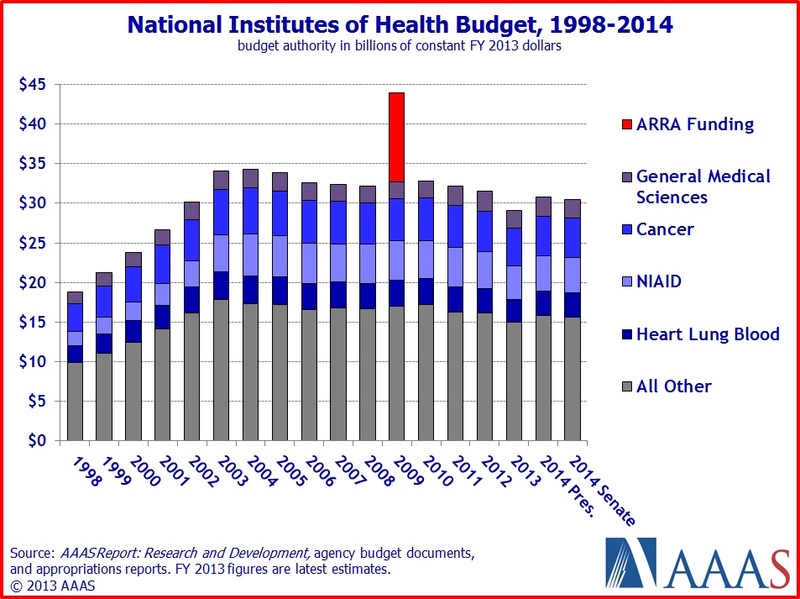 An alternative explanation for a rejected grant, is that the NIH only likes to fund old people. I’m being facetious, but only a little. Who still thinks it’s a good idea to have the fate of creative and groundbreaking ideas decided upon by a committee monoculture? I agree completely that the NIH grant process needs to be rebooted, as @MBEisen and @Drugmonkeyblog have discussed (and I refer you to them for a more systematic and objective (?) discussion). Briefly, and irreverently, my view on what’s wrong with the NIH process is that the smarter people try to be, the more danger there is in them being dumb asses. This view of course was influenced by my own sordid grant history. My currently R01 funded project is not what I started out with — I had two projects that failed agonizingly to obtain successful R01 funding, after 3 rounds of grant reviews each. First one, then the other broke my heart as the A2 scores came back nearly the same as the A1 score, unfundable, after massive efforts to respond to A1 reviews. (@drugmonkeyblog recently wrote about this phenomenon) It’s deeply ironic to me that the “deal-breaker” criticism of each grant was neutered by the passage of time. My first R01 application included an Aim on making and using a mouse knock-in model of the disease I was studying. The final judgement was that without the engineered embryonic stem cells in hand, there was no way the grant should be funded. It was rational decision on the part of the reviewers. I was depressed, but their judgement seemed fair. And yet, a similar knock-in model was later successfully created by another lab, and the insights it has yielded have yet to live up to our hopes. To my mind, the “alternate approaches” I outlined in my grant may have been the better approach. The case of my second project makes me smile even more ruefully. Although I now had a disease model in hand, my experiments were considered unworthy because my model did not, in my reviewers’ opinion, adequately recapitulate human disease. The primary reason I pursued my Myc-driven model of acute myeloid leukemia (AML) was that it looked, to my hematology-trained eyes, exactly like human AML. But, the scientist experts on study section noted, my mice had AML that was oligoclonal (comprised of not a single malignant clone, but several), and this was clearly not the case for the human disease. Case closed. Sigh. Except… now, a few years later, we know that human AML is, in fact, oligoclonal. Oops. People often inquire about the experiments I proposed in that grant, but we had to drop working on it. My bottom line is that while the writer of an unscored R01 needs to do some serious re-working, the NIH also has some serious re-working to do to address the reality that the job of a scientist has become predominantly about playing the grant game, which takes years of experience for most of us, rather than rewarding the smartest creative minds, which are usually younger than the grey-beards we reward now. This entry was posted in Uncategorized and tagged NIH by mtomasson. Bookmark the permalink. This makes no logical sense, and reviewers are not being “encouraged” to triage “mercilessly”. Where do you come up with this nonsense? Regardless of how studious and careful reviewers are, half of R01s are triaged. Well…I come up with just about all of my nonsense by using my lizard brain and my limited experience. My study section encouraged us to triage mercilessly. And I routinely witness the shoddy reading skills of reviewers for even discussed applications, so I look the leap and assumed that my colleagues would not be reading triaged grants *more* carefully than those they score. I like to live on the wild side. There is no such thing as “encouraging to triage mercilessly”. The bottom 50% (roughly) of grants based on preliminary scores get triaged automatically. It isn’t something reviewers choose to do. What the hell are you talking about? You don’t personally choose to triage any grants. You give your preliminary scores, and then based on the average of your preliminary scores and those of the other assigned reviewers, the bottom 50% of grants are triaged. It’s very disturbing that someone as ignorant of the process as you is participating in deciding people’s grants’ fates. IKR?? They really should get someone smarter than me, but y’all are SOL. Yes, yes…but the staff tells us over and over how to spread our scores, reminds us that 50% will be triaged, etc. Then there are grants with split/discordant scores. We are asked if we want to pull one out for discussion…and again reminded how hopeless a cause that would be. Come on, can we argue about something more significant? E.g. You’re not fooling anyone with that comb-over, you know.